(January 22, 2019 – Toronto, ON) Producer William Woods has announced the launch of Game Theory Films, a new boutique film distribution company based in Toronto. Game Theory will distribute narrative and documentary indies across all platforms in the Canadian territory. 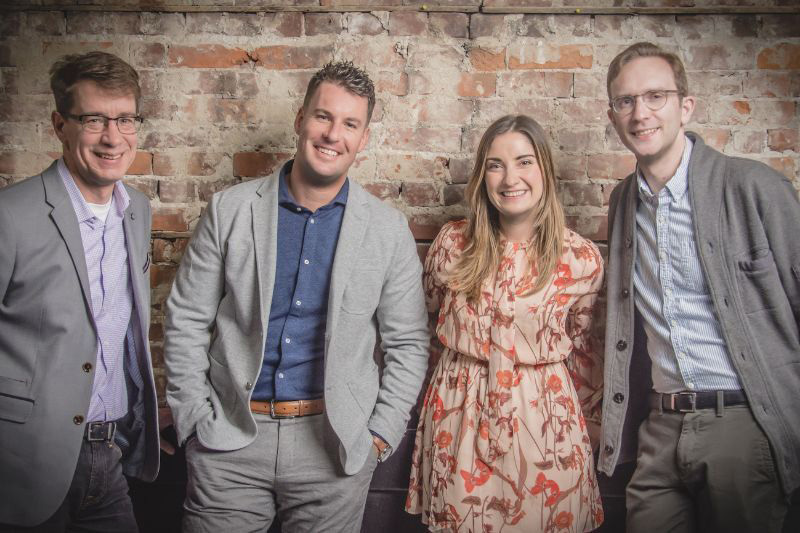 Pictured above are (L-R) distribution veteran Tim Smythe-Bishop has come onboard as Senior Market Strategist, William Woods as President, Hilary Hart as Director of Acquisitions and Distribution and Luke Black as Director of Development. The company’s first acquisitions reflect their goal to acquire films that are original, visually striking, and emotionally compelling. Game Theory has acquired the Canadian rights to Igor Drljaca’s first-ever feature documentary, The Stone Speakers, in advance of its international premiere in the Forum program at Berlinale ’19. They have also acquired Daniel Leo’s English-Polish-Portuguese language feature debut, Man Proposes, God Disposes. Promotional still from The Stone Speakers courtesy of Game Theory Films. 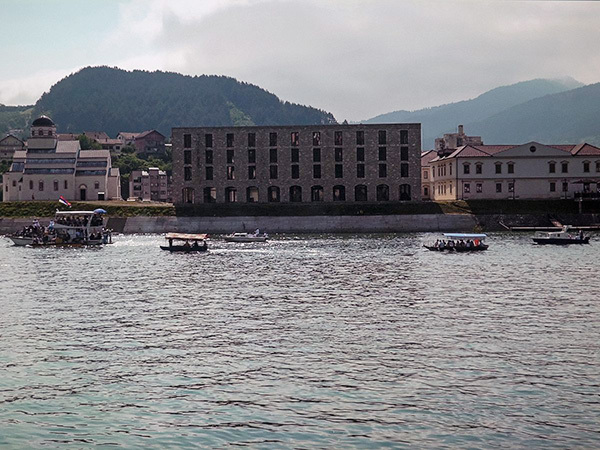 The Stone Speakers explores the transformation of four towns in Bosnia-Herzegovina as they find new life as unique tourist destinations that bring together history, religion, politics and folklore. Drljaca’s previous narrative films include the critically acclaimed Krivina, which sceened at TIFF 2012, and The Waiting Room, which screened at the 2015 Locarno Film Festival. Drljaca also co-produced Albert Shin’s Canadian Screen Award nominated In Her Place in 2015. Promotional still from Man Proposes, God Disposes courtesy of Game Theory Films. Man Proposes, God Disposes is about a young Polish man and a Brazilian woman who struggle to make sense of their relationship after a one-night stand leads to an unplanned pregnancy. From photographer-turned-director Leo, the film played an extensive festival circuit including Calgary, Mannheim-Heidelberg, Victoria, Glasgow, Prague and Shanghai Film Festivals. Game Theory Films will release both features theatrically this Spring. “Our first two acquisitions, The Stone Speakers and Man Proposes, God Disposes, reflect exactly where we want to be in the distribution market – collaborating with interesting filmmakers on the release of their passion projects. It’s a privilege for us to be working with such talented filmmakers to launch our company,” said Woods. “We understand that films are being consumed differently today than they were ten years ago. With that in mind, we’re eager to shape new distribution strategies in this evolving market by working with filmmakers to create tailored approaches for each film,” added Hart. “We teamed up with Game Theory in an effort to support bold new approaches by emerging distributors and because we liked Hilary Hart’s enthusiasm for the project. Hilary and her team have been very supportive of the film and along with my co-producer, Albert Shin, we felt like it was an ideal fit,” said Igor Drljaca, director of The Stone Speakers. William Woods is one of Toronto’s most highly sought-after producers. His last feature film, Mean Dreams starring Sophie Nélisse, Josh Wiggins, Colm Feore, and Bill Paxton, landed a coveted spot in the Director’s Fortnight at Cannes in 2016. His company, Woods Entertainment, currently has three features in post-production including Spinster starring Chelsea Peretti, The Rest of Us starring Heather Graham, Sophie Nélisse and Jodi Balfour, and Hammer starring Will Patton and Mark O’Brien. Woods will continue to produce while overseeing Game Theory Films. As Director of Acquisitions and Distribution, Hilary Hart brings experience in distribution and talent management to the team. She comes to Game Theory Films by way of Meridian Artists where she worked in talent management for three years. Prior to that, she worked at the Canadian Film Centre where she started in development later moving into administration and distribution. Earlier in her career she worked at short film distributor Ouat Media. Director of Development, Luke Black, first connected with Hart and Woods while attending the Canadian Film Centre. He has previously produced a dozen short films and was a board member for the Calgary Society of Independent Filmmakers, the Saskatchewan Filmpool Cooperative and the Independent Web Creators of Canada. Black continues to serve as Head of Development for Woods Entertainment (Mean Dreams). Tim Smythe-Bishop is a distribution executive with over 30 years-experience in the movie business. Tim began his career at Cineplex Canada in finance, before shifting his focus to distribution, bringing his talents to Polygram Films, Universal Films Canada and Sony Pictures Releasing Canada, where he managed a sales team with over 100 million in revenues. After twelve years with Sony he began a new division at Entertainment One, focused on implementing new strategies for the release of feature films in Canada. Most recently Tim has provided invaluable support in managing the release of Canadian and International films in Canada. Find more information about Game Theory Films online.